After a recent chat with a work colleague who does a bit of wheeling and dealing on the stock markets he convinced me that maybe I should invest some money in shares. As the UK is coming out of recession it would be a good time to invest. As always there is still a risk of losing your money. Putting my vast knowledge of absolutely no idea in to a plan, I decided to take the plunge with £3,000 we can’t afford from our Mortgage loan. I started looking at various graphs on how various companies had performed over the years. The better performing companies naturally have the higher prices so I looked into companies with cheap shares of under £0.50 hoping they will pick up over time. It seems this approach is high risk so I needed an affordable and safer way to invest. 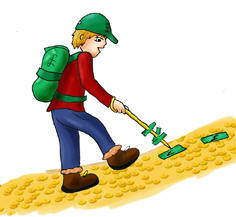 Then I came across investment funds. I looked at various investment funds available through UK banks and compared lots a graphs showing how the funds had performed over the years. Some where a gradual climb Granny could handle, some needed mountaineering equipment followed by a parachute, others just needed a set of ski’s. In the end I found a hiking hill. With my very limited knowledge went for a fund that I though would be profitable. Standard Life UK smaller companies. My thinking is if the UK is building up after a recession then smaller companies will gain well baring any issues with the Euro or USA defaulting again on their loan. So with the accuracy of a blindfolded darts player who had been spun round I set up my account and opted for the chosen investment fund. I got a starting price of £4.275 for 701 units. As the £3000 i have borrowed will incur an interest charge I need to make more than 32% over 5 years to break even. Anything above my target of £5.65 will pay some of the loan off. Day 1: I eagerly check the funds progress during my lunch break. 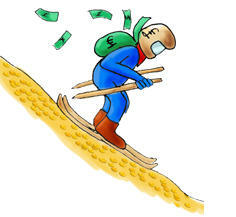 A 3.6p loss, looks like I will be trading my hiking boots for ski’s. Thankfully by the end of the day I was up 1p on my initial price. Go Granny go! Week 1: Yes! I made a loss, well other than the fee’s, 0.5 pence down on the initial price. Week 2: Up 5 pence, hours of looking at graphs and data looks like it is paying off. In the grand scheme of things I have got out the Garden gate without catching my coat on the latch for the big journey ahead. 3 Months: It’s been 3 month now. The shares started off steady and quickly built up to £320 profit just after Christmas but soon after that the value dropped back to £200. Since Christmas to the middle February the price has steadily increased to £247 profit. This entry was posted in Investment Gamble on January 30, 2014 by digiblog. It’s been a few months since my last update. In that time my fund has steadily grown, hurrah. There was growth after Christmas as companies that have done well have announced their results. With the general election this year there was a dip in performance as the polls couldn’t decide if there was going to be an out right winner for any political party. Now the Conservatives have been elected with a majority the share prices have grown well. Currently I’m over £200 above my starting price and starting to claw back some of the interest charges I have paid so far. The blue line on this graph shows the story of my investment fund since I started it in November 2013. The red line shows the price I got for the shares. in the low of October 2014 the loss was over £200, now im back up to a gain on the initial fund of £234. Lets hope that the story for the next twelve months is not like the last and this small investment meets my target. This entry was posted in Investment Gamble on May 17, 2015 by digiblog. Well what can I say other than, that didn’t quite go as well as expected. After 12 months and a promising start I am £113 down on my original investment plus the extra interest I have incurred on my account for taking the £3000 out in the first place. I still feel confident it will all work out in the end and I will at least break even. This month has been promising as I gained another £70 on last months total. Another month goes by and a few more pounds dissapear from my account. Though overall there was a loss of another £49 the picture is slightly better than it was looking at first. The month started at £4.056 per unit and fell to £3.802 by the middle of the month at total loss of £178. For the second half of the month there was a steady rise back up to £3.985 per unit so in the end it was just a £49 loss. Next month my investment will be 1 year in, lets see if the wheelers and dealers can manage to at least get this “investment” back up to the starting price. This entry was posted in Investment Gamble on November 26, 2014 by digiblog. I was getting worried there, I though I was going to get back into profit during September but normal service has resumed to the tune of a £160 loss. I know pocket change to people investing with a lot more than I will ever have but it is all relative. A loss is a loss. It will be a year in November since I started this investment fund. After a promising start I thought I may just make it into a true profit in the first year. At the moment I would be surprised if I get back to the starting price. It looks like it may be a while before this investment fund makes me any money. Though I feel it will eventually make a profit, key economies are struggeling at the moment such as Germany, China and the USA. Even though the UK is still doing well relatively, it is not being reflected in the share prices. Things are very up and down with the overall trend being down. This entry was posted in Investment Gamble on October 25, 2014 by digiblog. Finally a bit of progress in the right direction. Gained £100 through August so only another £52 to get back to my starting point. 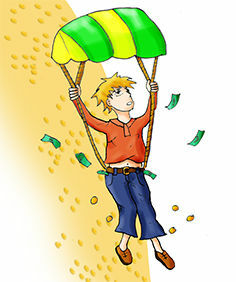 I can finally put the parachute away so that’s a plus but overall my investment is still loosing money. Throughout July the value has gone up and then gone back down again, even though there has been a lot of positive news about Britain recovering well from the recession. Month end value £4.078 which is a 4.7% loss on my original investment, down £141.32. This entry was posted in Investment Gamble on August 10, 2014 by digiblog. No improvement in June overall, so the parachute is still a requirement. The price of the shares continued to fall to 4.19% below the start price leaving me a £125.61 loss on my “investment”. Though for the last week there was some gains so moving in the right direction. 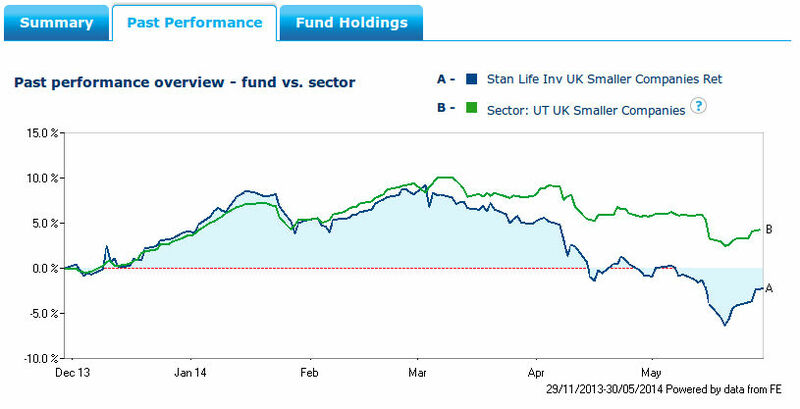 I looked up a few reviews of the standard life small UK investment fund and it seems that though there has been a drop in the funds performance, as some of the bigger investments such as ASOS, the online retailer, have had major losses, there is confidence that the fund will bounce back soon and was still a good fund to invest in. I’m going to have to take their word for it as I know nothing. I’m the hands of the experts! This entry was posted in Investment Gamble on June 30, 2014 by digiblog. I think I need a another image, Roller Coaster. Through May the share prices continued to plummet. It eventually levelled out at £110 loss on my starting price, -3.67%. Then in the last week of May they started to rise to a £14 loss. Looking at the various graphs that track the funds it looks like an investment decision in February has caused the loss as the graphs start take a different route compared to the industry standard measurement. This is now back in line but tracking below where it should be. Hopefully things will improve through June. This entry was posted in Investment Gamble on May 30, 2014 by digiblog.